The third B is the one for discussion here! Now there are many definitions for Low Level Flight but I think that this one makes sense. Low level flight can be defined as: ‘Operation of aircraft in such proximity to terrain and obstacles as to compromise the safety of the aircraft, its occupants and that of persons or property on the ground or surface of the water’. From this definition, the point is that although an aircraft might be flown with more than adequate terrain clearance and at a safe altitude while in its present position but what about its performance ability to clear obstacles and terrain in the immediate vicinity in terms of turn radius and climb performance with the energy at hand? That’s something to think about and which may change your whole perspective of the term ‘Low Level’! 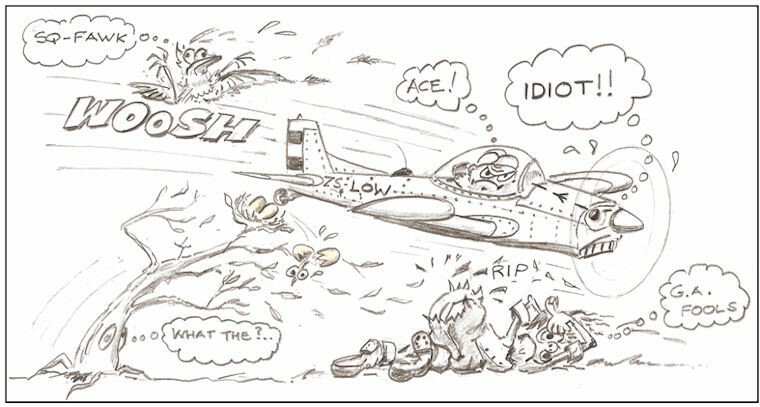 Every day as pilots we’re exposed to Low Level Flight and the associated threats and risks! For example, immediately after Take Off, as we climb to safety and then again on the Approach to Land as we descend from safety into the Low Level Environment! Circle to Land Procedures from an Instrument Approach are notorious in the number of aircraft claimed – why? – Because the aircraft has descended into the Low Level Environment where it must be maneuvered VERY CAREFULLY to ensure terrain and obstacle clearance often done in somewhat reduced visibility. The most crucial stage in an Instrument Approach is the decision to execute a Missed Approach – why? – Because it offers a way back to safety from the Low Level Environment to a safe height above terrain and obstacles. Need more convincing? HEIGHT IS SAFETY and is like MONEY IN THE BANK. Height above terrain gives us time to think and stratergise in the event of an emergency and offers us a way out from what could be a lethal situation! Height takes us into the realm of being able to perceive the picture below and affords us the time to make good decisions. Whereas flying at Low Level offers us a small band of opportunity and safety and is a place of basic survival. With reference to (b) above, here’s a humorous tale about a farmer situated close to New Tempe airport which was the finishing line to the Presidents Trophy Air Race one year. His farm was based exactly on the inbound track to Tempe. Flying low over agricultural land and property can cause huge damage and injury to livestock! I also know a person that was once threatened by a farmer for damages to the tune of what most of us would not be able to afford for injuries caused to his ostriches! But Whichever way, if you fly for long enough you are going to at some time or another end up in the Low Level Environment – either by choice (not a good decision) or by being forced there by making poor pre flight or in flight decisions – also not good. By maintaining good situational awareness it should be possible to avoid the unplanned operational need for low flying but pilots need to be familiar with Low Flying and the hazards involved should the inadvertent need arise. Good aviation practice dictates that a pilot should never need to fly lower than he/she must or lower than the law allows. By setting personal limits well above the legal VFR minima (see previous article ‘Weather to GO or not to GO?’), and then always having Plan B and C as an escape to the nearest alternative airport is first prize. If these opportunities are left to slide by, then a Precautionary Landing is in order rather than pressing on. Pressing on has killed so many people! NOW LET’S GO INTO THE LOW LEVEL SITUATION. ‘A body in a state of rest or steady motion will remain so unless acted upon by an external force’. This is your aircraft flying at a constant speed and direction and so to change its’ direction you need to apply a force by way of a control input but this change in direction cannot be expected to be immediate – there will be a time lag – the higher the speed the longer the lag. The effect of Inertia is hardly noticeable to the pilot at higher altitude but once close to the ground the significance becomes apparent. Bear in mind that for a given angle of bank RADIUS OF TURN increases with an increase in TAS so to minimize the turn radius or space in which to turn you’d best slow down to a safe speed. By slowing down you are giving yourself more time to think and more clearly observe and anticipate hazardous obstacles such as power-lines. Slowing down is best done by bringing the airspeed down to the white arc on the airspeed indicator and then applying the recommended flap setting for slow flight (aircraft type specific). Applying Flap in most aircraft will provide a slightly lower nose attitude in level flight offering better forward visibility to the pilot while at the same time will reduce the stalling speed too. It’s important to know your aircraft well and by understanding that Power + Configuration + Attitude = Performance. In this case the performance sought is Airspeed and so to fly at a constant indicated airspeed there will be a power setting to do that in straight and level flight. This will reduce the work load on the pilot by negating the need or urge to make constant power changes except when turning or climbing which of course will need an addition of power to suit. We can call this the ‘poor visibility configuration’ which is a very good idea to adopt in the Low Level Environment! Also with Landing Lights On! The EFFECT of WIND at Low Level (especially a strong wind) can be profound and present the pilot with a number of powerful ‘Visual illusions’. For example when flying into the wind the Groundspeed will be low which could lead the pilot to either increasing power or lowering the nose or both. Conversely flying out of the wind the Groundspeed will be high leading the pilot to perhaps decreasing power thus reducing the Indicated Airspeed and also an urge to raise the nose. Either one of these two reactions or a combination of both could bring the aircraft to an unsafe Indicated Airspeed. When flying across the wind – Drift will be most noticeable and so adequate Drift Correction must be made by the pilot in order to follow a desired track across the ground. There is a natural tendency for the pilot to want fly with crossed controls – this must be avoided and balanced flight must be maintained. TURNING at Low Level can offer some challenges in a strong wind. 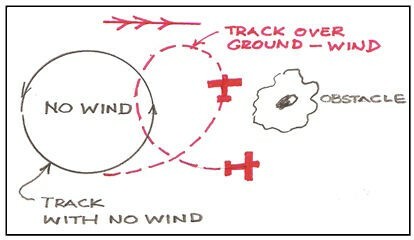 See the diagram below which demonstrates how wind will alter the desired track covered over the ground. The problem here is that in an attempt for the pilot to maintain the desired track produces a strong tendency for the pilot to increase the bank angle sometimes quite radically when turning from downwind into the wind because of the drift experienced. This can be very hazardous since we all know how Stall Speed increases with an increase in bank angle. Conversely bank angle must be decreased when commencing a turn out of the wind to downwind. On a day when there is a strong cross wind blowing observe how pilots tend to overshoot their turn onto Final Approach (Hammer Head) from a strong tailwind on Base leg and then watch how there is a tendency to over-bank in the turn onto Final Approach in order to regain an acceptable approach path to the runway. Not good!!! There is also a Sensation of Skidding and Slipping. Slipping into the turn when turning from into the wind to downwindand skidding out of the turn when turning from downwind into wind the pilot must be aware of these sensations and illusions and by all means ignore them and very importantly maintain balanced flight with the ball in the centre. TURBULENCE, ROTORS and WIND SHEAR caused by surface friction, obstacles and topography will also make the Low Level Environment an uncomfortable and hazardous place to be. Turbulence is another good reason to slow down to a safe maneuvering speed. Rotors and Strong Down drafts caused by terrain can be very strong and have been the cause of many accidents. By understanding the conditions that cause them, much can be done to anticipate them and plan around them. Micro bursts and wind-shear in the vicinity of Thunderstorms is also an area of great concern and to be anticipated and watched out for. When there is ridge or rising ground ahead on track, how do you know that at your present height that you’ll be able to clear it without climbing? The rule of thumb is that if you can see a horizon beyond then you’ll probably be able to clear the terrain. But here you have to be very careful in discerning that what you see beyond is actually a horizon and not a mountain range, or more – higher terrain! Be sure that the gradient of the rising ground ahead does not exceed the performance of your aerie! Don’t get stuck in the situation where you can’t turn away without still maintaining a positive rate of climb! You think I’m joking – just a little while ago a pilot practicing Precautionary Landing Procedures at fairly low level turned towards high ground and found that at full power he could not clear terrain and also could not turn (remember to turn you need more power to compensate for the additional drag in the turn). He made contact with terrain but fortunately was not hurt – the aerie however was a write off! Don’t ever stick your nose into a valley in marginal weather thinking you can make it through to the other side. Could be a boxed in valley with insufficient space to turn around – there could be power lines – rising ground in the valley could exceed the climb performance of the aircraft and could also lead you into cloud. There is one place a pilot must be absolutely sure of his position and the nature of the terrain he/she is pointing the nose of the aircraft toward and that is in the Low Level Environment especially in bad weather or reduced visibility. This requires a high standard of map reading and navigational ability. Map reading and visual navigation at low level can be tricky since you no longer have the advantage of a ‘bird’s eye view’ of the area to be navigated over and requires some practice to be proficient at it. The position of the Sun offers up a whole bag of hazards by reducing clear forward vision. Never fly close to terrain with your nose pointing toward the Sun – this is a big no – no! Beware of the added confidence given by good G.P.S. navigational equipment here because it could just lead you further into trouble when the pilot’s mindset is to push on!!!! (refer to previous article ‘Go to Button’). By all means make use of this equipment but do so with care and vigilance. Remember too that the useful range of VOR and ADF equipment will be reduced and depending on the distance from beacons could become useless. Range (n.m) = 1.25 x the square root of the altitude of the aircraft – elevation of the transmitter (feet). Also VHF radio range to an ATSU will be reduced making two way communication with ATC not possible. When flying low over a body of water one needs to be particularly careful especially when there is no wind to add ‘texture’ to the surface by way of ripples or waves. Ones depth perception over a flat and consistently smooth surface is severely compromised. So often pilots have simply flown into the water with dire consequences! When following a Line Feature such as a railway line, road, coast line etc., make sure that you do so as the Law and good reasoning says you should and that is with the line feature on your left. This is for two reasons, one is that you, the pilot sitting on the left hand side of the aircraft will have a clear view of it and the other is that hopefully any other aircraft following the same line feature but in the opposite direction will apply the same rule and thus you’ll miss one another. Remember that line features such as roads and railway lines tend to follow topographical contours through valleys but also go through tunnels through which aircraft cannot be flown! A very large number of forced landings are caused by fuel mismanagement, either running out of fuel completely or incorrect system status management. The possibility of running a fuel bay dry at low level is high since the pilot is dealing with a high work load and his/her attention to fuel management can easily be compromised. Think- an engine stoppage at 500′ A.G.L. gives somewhere around one minute before contact is made with mother earth. The productive time to get on with emergency procedures and executing a forced landing is less than that because some time will be lost in realizing the actuality of the event. Then be sure the terrain over which you are flying offers a suitable patch of lawn to land on. So you see how fine you’re cutting things at low level! Best to monitor and manage fuel supply and the health of the engine very carefully here and then forever be considering a suitable place to land as you cover the track flown and be extra alert to the event of an engine stoppage and the possible causes – don’t forget the possibility of carburetor icing and also birds flying up into your path. Not to mention difficult to see traps such as the Earth Wire above the Power Lines and how and where to cross Pylons. Low level flight indeed increases the work load on a pilot and offers a very narrow band of opportunity in the event of something going awry. To wrap up then – before you stick your nose into the Low Level Environment. · Know what you are letting yourself in for. · Be sure that there will be a safe outcome. · Make sure that your navigation skills are up to it. · That you’ve been trained and are competent in the specific challenges. · That you’re prepared to take the full rap for your actions. Remember that Height is like Money in the Bank and hey- who wants to be poor! SO LET’S ENDEAVOR TO ALWAYS KEEP A LOT OF BLUE SKY BELOW US AND IN SO DOING LIVE A RICH AND HAPPY LIFE! Until next time – keep it safe!